Embarking on a crusade to unearth technological advancements for energy efficient alternatives, mining equipment market players, in recent times, have been making agonizing attempts to bring forth a flicker of novelty in their product portfolio. The extensive requirement of metals, limestone, rock salt, potash, coals, dimension stone, clay, and gravel for a plethora of end-use domains has led to a spike in the demand for high-grade machinery such as conveying, on-line elemental analysis machines, drills, crushing machines, blasting tools, and earth movers for extraction purposes. In consequence, this has conveniently prompted companies in mining equipment market to continually bring about innovation in underground mining machinery and screening equipment. As the globe treads alongside the path of increasing exploration and the demand for real-time monitoring gains more precedence, mining equipment industry outlook is most likely to undergo a dynamic metamorphosis of sorts. While Europe once reigned as a supreme power as far as mining was concerned, the late 19th century witnessed the reign of the mining sector slow dwindle in the continent. This transformational shift can principally be credited to the fact that North America then emerged as the key political and economic power, which later had a critical impact on the regional and global mining equipment industry landscape. Further on, in the late 19th century until the early 20th century, the United States evolved as a major avenue for mining, which led to a dramatic propulsion of the regional mining equipment market. Post the Second World War though, North America met the same fate as Europe, and the sovereignty was then passed on to the emerging economies. Since then, mining equipment industry trends have been experiencing virtual fluctuations, as the shift of mining locations from developed to developing countries became a rage over time. As on today, Asia Pacific, Latin America, and North America are nearly consistent contributors toward mining equipment market share. The United States in particular, encompasses manufacturers who have been focusing on lowering production costs and adhering to the emission standards set by numerous regulatory bodies. Though the region experienced a slight slump post the economic recession, analysts predict U.S. mining equipment industry size to increase by several notches, with a CAGR estimation of 3.2% over 2016-2024, driven by the fact that manufacturers, post 2017, are projected to substantially increase their capital spending and target the development of advanced lease-based equipment as well. 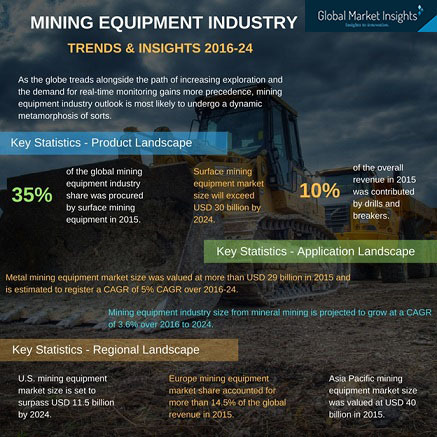 The competitive spectrum of mining equipment market is inclusive of top shots such as Caterpillar, Joy Global, Sandvik, Hitachi Construction Machinery, AB Volvo, Atlas Copco, Komatsu, Metso, and Doosan Heavy Industries. Having already consolidated their presence across this lucrative business vertical, it is expected that these biggies would in the years to come, empty their offers for large-sized projects that would span at least a decade or two, and have profitable returns post the operational duration. This paradigm shift would thereupon, enable mid-sized companies to exploit the opportunities in mining equipment industry and chance upon small-scale but rather viable projects, further impelling the growth of this business sphere. As per estimates, global mining equipment market size, driven by the water shortage and related issues at specific ores and the subsequent demand for effective solutions such as robust hardware and mechanized components, stood at a profound USD 69 billion in 2015. Mining equipment market, pertaining to the robust demand for technological innovations and sustainability, has witnessed numerous players adopting the tried-and-tested tactics of M&As and product differentiation. Collaborations with raw material suppliers for sustainability maintenance is also on the cards, as is the focus on the improvement of the overall supply chain performance. Mentioned below is a gist of the contributions that some of the most pivotal mining equipment industry companies have made toward this business vertical so far, and which are expected to be a part of this competitive landscape in the years ahead, making mining equipment market a viable avenue for potential investors. Atlas Copco, a Swedish provider of sustainable productivity solutions, has been a part of the mining equipment industry landscape since decades. The company boasts of a widespread mining product landscape and a huge consumer pool, on the grounds of which it has a stronger hold in mining equipment market over many of its contemporaries. A few years back, in 2012, the firm made it to the headlines for expanding its portfolio of mining equipment with the acquisition of the Swedish company GIA Industri. Through his takeover bid, Atlas Copco, back then, added utility vehicles, ventilation systems, and electric mine trucks to its underground mining equipment pipeline. Furthermore, the deal strengthened the company’s outlook in mining products, helped the firm penetrate newer markets, serve a wider customer base, and eventually consolidated Atlas Copco’s position in global mining equipment market, empowering its sales network and product offerings in the years to come. The company’s pivotal stance in mining equipment industry is vividly coherent from the fact that recently in November 2017, Anhui Conch Cement, the largest cement manufacturer in mainland China, planned to purchase a hydraulic drilling rig for a cement plant at Shaanxi. Given that Atlas Copco is one of the leading equipment suppliers, the Chinese firm collaborated with the Swedish mining equipment industry behemoth to supply the necessary products by February 2018, at an estimated cost of USD 1.7 million. Besides the cement fraternity, Atlas Copco is renowned to be a leading supplier for companies in numerous other end-use sectors, thus validating its stance in global mining equipment industry. Speaking along similar lines, the firm, merely a month after its purchase deal with Anhui Conch, acquired the assets of Cate Drilling Solutions LLC., its US-based drilling equipment and component distributor and service provider. Through this deal, the company will now hold the exclusive rights to Cate Drilling Solutions – a move that would further position the firm as a prominent shareholder in mining equipment market. The month of November has proved to be a roller-coaster of sorts for Caterpillar Inc., a prominent company partaking in U.S. mining equipment industry share. Earlier in the month, the firm made it to the headlines for having ended its supposed deal with Uptake, a data analytics startup. Apparently, the deal couldn’t see the light of the day, owing to the fact that Caterpillar’s scope of expansion in mining equipment market was not exactly in conjunction with Uptake’s interest in the alliance. Despite the unceremonious cutoff, the incidence indeed propagated that Caterpillar’s goals with regards to mining component manufacturing and commercialization soared higher than ever. As if to prove skeptics wrong, merely a week later, the company announced its deal with China Energy Investment. Caterpillar’ collaboration with China Energy Investment Corp spans over five years, and outlines all the collaborations of the future with regards to mining equipment rentals and sales, product manufacturing support, and tech applications. The deal is also said to strengthen the Sino-US economic & trade relationship, as the mining equipment that would be supplied to China Energy for its upcoming project pipeline would be exported from the United States. With this alliance, Caterpillar is expected to considerably strengthen its position in mining equipment market, while simultaneously China Investment to gain ground in the international mining sector. Komatsu is reputed to be one of the most proactive contributors in mining equipment industry share, especially in case of tapping technological expertise. Recently, the company made it to the headlines for having implemented an IIoT platform powered by Microsoft Azure and Cloudera Enterprise in order to help global businesses monitor mining performance and analyze machine efficacy – a dire need for mining equipment market firms as on today. With this software, the company also aims to target asset utilization and productivity to deliver industrial minerals and energy solutions for the global economy. Undeniably, the deal has sparked quite an interest among IIoT proponents and major mining equipment industry players, who would now be precisely responsive toward tapping smart solutions for mining equipment production and sales. Komatsu, in the year 2016, had been in the news for its large-scale acquisition of Joy Global, for a valuation of around USD 3.7 billion. The deal was apparently propelled forward on the presumption that the underground mining and underground mining sectors would witness a spike in the years ahead, driving the need for related components, subsequently impelling the overall mining equipment market. In fact, Komatsu’s acquisition, back then, had been forecast to prove lucrative specifically for the surface mining equipment industry. The deal also added advanced mining equipment, drills, super-sized loaders, rope shovels, drills, and draglines to Komatsu’s product range. Joy’s takeover thus, proved to be a rather profitable venture for Komatsu, substantially enhancing its stance in global mining equipment industry. Since the last half a decade, the geographies of Africa, Latin America, and parts of Asia have been observing an onslaught of investments in the mining arena, that has had a rather appreciable influence on the mining equipment market. Experts predict that the trend is certain to continue over the next decade or so, driven by the robust growth in exploration activities across these economies. This rise again, may be credited to the currently depleting mineral deposits across the developed geographies such as Europe and the United States, the prevalence of huge vessels that facilitate the trade of coal, bauxite, iron ore, and other mineral commodities, and the highly advanced tech developments that have led to easy accessibility of mineral deposits in remote areas. In essence, it would be apt to state that mining equipment industry growth is highly ancillary to the advancements in the mining domain. Not to mention, in recent times, maintenance and after sales services have been gaining precedence as promising avenues, which is one of the key pointers that potential investors would need to bear in mind. Furthermore, the need to access remotely available deposits owing to ore depletion and the subsequent requirement for advanced equipment would drive the demand for automation, thereby augmenting the revenue graph of mining equipment industry. In the forthcoming years, the changing technologies of extraction and newer breakthroughs in the mining ecosystem are poised to bring about renewed growth prospects for mining equipment market players, which in consequence, would have a lucrative impact on the remuneration of mining equipment market.